LOCATION.--Lat 41`07'49", long 75`37'33", Monroe County, Hydrologic Unit 02040106, on left bank 75 ft upstream from bridge on State Highway 115, at Stoddartsville, 1.9 mi upstream from Tobyhanna Creek, and 4.0 mi southwest of Thornhurst. PERIOD OF RECORD.--October 1943 to current year. 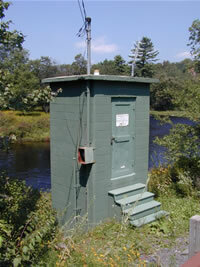 GAGE.--Water-stage recorder, crest-stage gage, water-quality monitor, and heated tipping bucket precipitation gage. Datum of gage is 1,463.81 ft above National Geodetic Vertical Datum of 1929. Prior to Oct. 1, 1946, non-recording gage at site 350 ft downstream at datum 2.14 ft lower. Satellite and landline telemetry at station. COOPERATION.--Funding for this station provided by the U.S. Army Corps of Engineers, Philadelphia District, and the Pennsylvania Department of Environmental Protection.